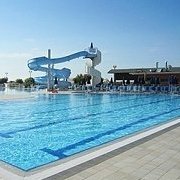 The fantastic swimming pool at Hotel Cesare Augusto is located near Bibione's amazing beach, which becomes the backdrop to the complex. 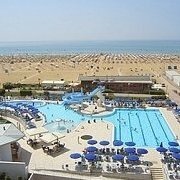 Pools are offered at Hotel Lido, also owned by the Fontana Family, which is approximately 20 metres away. 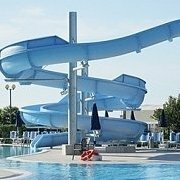 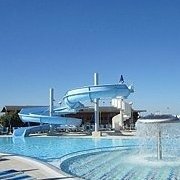 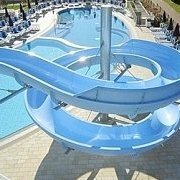 The Hotel offers all guests the use of the brand new swimming pools: a semi-Olympic size swimming pool with a big water slide, a swimming pool for children with water games, a large mosaic hydromassage tub with sitting space for 20 people and heated water to offer you maximum relaxation. 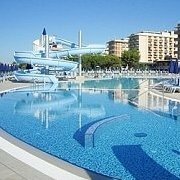 Located very close to the swimming pools is an area entirely dedicated to children with games and a really fun trampoline. 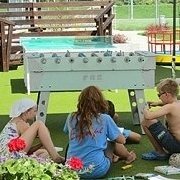 All of the services are available to guests for free.